When Anthony Bridgerton decides it is time to marry, he wants no part of love. He sets out to make Edwina Sheffield, the beauty of the season and someone he can tolerate without loving, his future bride. When he discovers Edwina will not marry unless her sister Kate approves of the suitor, Anthony makes impressing Kate his number one priority. But is he enjoying his time spent with Kate too much? 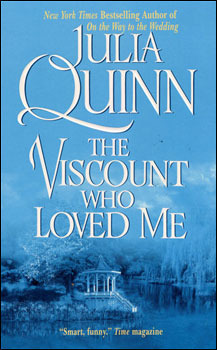 After a string of disappointing reads, I knew I could count on Julia Quinn and the Bridgertons for an enjoyable read. This second installment certainly delivered. Anthony is a conflicted but likable hero. Determined not to fall in love, he doesn’t know how to handle the feelings he’s developing for Kate. used to standing in her sister’s shadow, Kate fully expects to become a spinster. how can she believe Anthony would choose her over the beautiful Edwina? Full of witty humor and tender moments, I read the entire book with a smile on my face. And really, can you ask for anything more? I love all things Bridgerton! Yay for you, Kate. I just finished the 3rd one. I hope to read through the series this year.